A U.N. peacekeeper from Brazil poses for a souvenir photo before the start of a patrol in the Cite Soleil slum, in Port-au-Prince, Haiti, Feb. 22, 2017. Years of easygoing patrols like the one on this recent afternoon in the steamy seaside district of Cite Soleil is a clear sign to many in Haiti and around the world that it’s time to wrap up a U.N. force that has been cycling through this Caribbean country since a 2004 rebellion engulfed Haiti in violence. 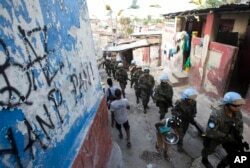 U.N. peacekeepers from Brazil patrol the Cite Soleil slum in Port-au-Prince, Haiti, Feb. 22, 2017. They faced no greater threat than a few barking dogs along some of the same streets where pitched gunbattles between gangs and U.N. peacekeepers used to be a daily occurrence. “This would be unprecedented in U.N. peacekeeping history. Normally, police only serve in peacekeeping missions with military support and backup. But it’s a creative option to reduce the mission’s size and cost as MINUSTAH gradually works toward a full exit,” said Aditi Gorur, who researches peacekeeping issues as a director of the Washington-based Stimson Center think tank. The U.N.’s first-ever stabilization mission came to Haiti in 2004 following a rebellion that ousted President Jean-Bertrand Aristide and had the chronically troubled country on the brink of collapse. There were daily deadly clashes among gangs loyal to Aristide’s faction, rebels and ex-soldiers, and rogue police. A wave of killings and kidnappings followed, aimed at destabilizing a U.S.-backed interim government. AP journalists recently joined a few dozen U.N. peacekeepers and four Haitian police officers on an uneventful foot patrol and checkpoint duty in a Cite Soleil neighborhood once controlled by gangs. 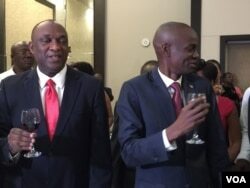 “The government needs to negotiate MINUSTAH’s departure as soon as possible,” said Sen. Patrice Dumont, who represents the West department, which contains about 40 percent of Haiti’s electorate. But President Jovenel Moise and legislative leaders say the vastly improved police force is not enough. They want a real military to replace the army that was abolished in 1995 after a long history of coups and human rights abuses. They say a reconstituted army would create jobs, protect borders and assist during natural disasters. But with coffers so depleted that many public workers aren’t getting paid, creating a new military would require sustained international support, said Jake Johnston, a researcher for the Center for Economic and Policy Research in Washington. 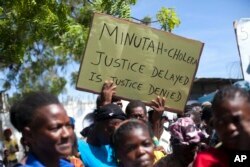 FILE - Cholera survivors protest the United Nations peacekeeping mission outside U.N. headquarters in Port-au-Prince, Haiti. On a recent day in Cite Soleil, home to more than 400,000 people, a group of men sat in the shade and gazed at Brazilian soldiers stopping motorists at a checkpoint. They broke into laughter when asked about their political leaders’ military ambitions. Weeks before leaving office in February 2016, then-President Michel Martelly passed a decree to reinstate the army, but a real one doesn’t exist.